Garlic and perennial onions are alliums with similar growing and storage requirements. Under the right conditions these are very productive crops, with harvests 3–8 times greater by weight than the amount planted. With the right care these alliums are self-sustaining, so they are particularly appropriate if you are interested in local food, permaculture and perennial crops. Perennial Leeks: (Allium ampeloprasum) Easily propagated by divisions, cultural information on page 4. Elephant Garlic: (Allium ampeloprasum) closely related to leeks, the very large cloves are mild enough for eating raw. Hard-necked garlics: (Allium sativum var. ophioscorodon) produce scapes (hard-stemmed flower stalks that bear aerial bulbils) and have a variety of complex flavors. They have fewer and larger cloves, which makes for easier peeling in the kitchen, but they do not store as well as soft-necked varieties. Some hard-necked garlics grow well in the Southeast but they generally prefer the cold winters and long, cool springs of more northern climates. German Porcelain, Music and German Extra Hardy are popular hardnecks. Artichokes are very vigorous and large-bulbed with many cloves. Plants are shorter than hard-neck varieties with spreading rather than upright leaves. The leaves are broader than any other variety and a deeper green than most. Inchelium Red and Italian Softneck are popular artichoke-types. Silverskins are the type most often found on supermarket shelves due to their very long storage life. They are the highest yielding variety, having 15–20 cloves per bulb, usually in 5 layers, and do well in a wide range of climates, from hot Southern to wet maritime and cold northern climates as well. Asiatics and Creoles are generally classified as weakly bolting softnecks that are well suited to mild winter areas and are generally the first garlic to be harvested each year. These bulbs mature rapidly in their final weeks, so make sure to harvest these before the heads become overmature and start splitting. Garlic and perennial onions will grow in a range of soil types, but your yields will be much better if you pay close attention to soil structure. Roots need air as much as they need water. These bulbs do best in a well-drained, sandy loam, but you are probably not blessed with perfect soil. Whether you have heavy clay or loose, sandy soil, the most important thing is to add lots of organic matter. You can work in compost, aged manure, well-rotted sawdust, or peat moss. Growing and incorporating an appropriate cover crop before planting adds lots of organic material. All of these methods will improve your soil and grow better crops. Planting in Raised Beds: Raised beds are ideal for garlic and onions. The size doesn’t matter as long as you can work the beds without walking in them. It is important that the soil be well prepared to a depth of at least 8 in., preferably 12 in. Beds can be framed with logs or rot-resistant lumber such as locust or cedar, or concrete blocks. Avoid pressure-treated wood, especially if you’re an organic gardener. You can fasten the corners with spikes or plumbing strap or one of the new commercially available products. Garlic and onions prefer a fairly neutral pH, 6.5 to 7.0. Soil that is too acid or too alkaline causes slow growth and late maturity. If you haven’t already done so, get your soil tested through your county extension office. If necessary, raise the pH by adding dolomitic limestone or wood ashes (sparingly). To lower the pH, add sulfur dust or fertilize with ammonium sulfate. Test your soil again next year to see if it’s at the optimum pH. 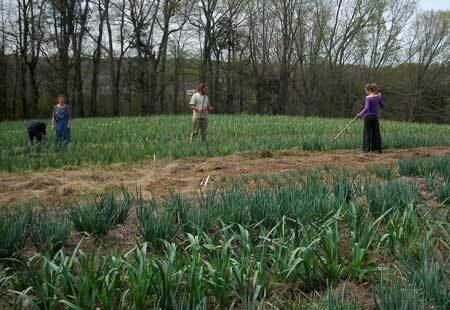 Garlic and onions are heavy feeders and respond well to fertile soil. Particularly important are phosphorus and potassium. Commercial fertilizers generally indicate the ratio of primary plant nutrients as a three number ratio, such as 5-10-5, that represents nitrogen-phosphorus-potassium. A soil test will help you make the most of your garden. Use rock phosphate or colloidal phosphate to supply phosphorous, and greensand to supply potassium. These materials also supply trace elements, and maintain fertility over several years. If you’re short of nitrogen, add compost, aged manure, feather-meal, fish-meal or other high-nitrogen amendments. Incorporate them well before you plant, if possible. You can also add nitrogen later in the fall when the garlic or onion leaves are 4–6 in. high. Fish emulsion (5-1-1) works well for this purpose. Nitrogen should not be applied during bulb formation. Too much nitrogen at this time can produce bulbs which are susceptible to rot. Soils derived from red rock may be deficient in magnesium (correct with dolomitic limestone), and black soils may be deficient in iron (correct with compost or Sequestrene). Nutrient Deficiency Symptoms: If your soil is nutrient-deficient, your alliums may show it in several ways. Yellow-green plants with necks that do not collapse indicate nitrogen deficiency. Phosphorous deficiency results in light green plants which mature slowly. Potassium deficiency results in light green plants with brown tips and poor bulb formation. Potato onions and shallots may be planted in both spring and fall. Fall planting gives significantly larger yields, often double or triple the yield of spring-planted bulbs. The trade-off is that a particularly harsh winter may kill fall-planted bulbs, especially if you plant them improperly or fail to protect them. We strongly recommend holding some bulbs for spring planting as insurance against losing your planting stock. If you plant in both spring and fall, plant the largest bulbs in the fall and save the smaller bulbs for spring. Fall planting: In areas with mild to moderate winter weather such as Virginia, plant potato onions and shallots from mid- October until about mid-December. Planting too early encourages disease and damage by rodents. Planting too late prevents the roots from becoming established before winter. We plant large bulbs earlier, and small bulbs later. Early to mid-November is usually the best planting time. Farther north or in mountainous areas, plant at least 2–3 weeks earlier. In warmer areas, plant 2–3 weeks later. Fall-planted onions will often grow enough to produce green onions for mid-December harvest. This top growth may be winter-killed, but growth will resume in the spring. Spring planting: Plant as soon as the soil can be worked (often late winter). Spring planted bulbs may mature 1–2 weeks later than fall-planted bulbs. Shallots are less likely to bolt if spring-planted, but yields will be smaller. White multiplier onions and perennial leeks: Bulbs for these sprout as early as late August, and can be planted early, but the sprouted bulbs hold well – we’ve successfully waited 1–2 months to plant them. Garlic, elephant garlic and Egyptian walking onions: All varieties are best planted in the fall. Some softneck varieties can be planted very early in the spring if necessary, but yields will be greatly reduced. In a moderate climate such as Virginia, the best planting time is mid-October to mid-November. In cooler or warmer areas, adjust planting dates accordingly. Perennial Onions: In Virginia and further south, multiplier onions should be planted with ½–1 in. of soil above the bulbs. A 2–3 in. layer of mulch controls weeds and protects against temperature extremes. Deeper planting is recommended for mountainous areas and northern latitudes. We recommend planting bulbs in rows with soil hilled 2–5 in. deep. In spring, scrape away some of the soil; otherwise the bulbs will be elongated and may not store well. (Scrape carefully to avoid exposing the shallow roots.) 4–8 in. of straw mulch is recommended for extreme northern areas, but remove it promptly with the arrival of the first spring thaws. Well-mulched plantings can be more shallow than the recommended depths, provided that the mulch is very deep and a snow cover develops. In raised beds, large perennial onion bulbs (3–4 in. diameter) should be planted 6–8 in. apart, depending on bulb size. Smaller bulbs (½–2 in. diameter) should be planted 4–6 in. apart, depending on bulb size. When planting in rows (usually spaced 12 in. ), large bulbs should be a minimum of 8 in. apart, and small bulbs a minimum of 3–4 in. apart. White Multiplier and perennial leeks should be spaced 2 in. apart in rows 12 in. apart. Space Egyptian walking onions 9 in. apart. Garlic and Elephant Garlic: Garlic bulbs should be separated into cloves just before planting time. (Keep the skins on, they protect the cloves from rotting.) Best results come from planting larger cloves from larger bulbs. The second best choice is larger cloves from smaller bulbs. Fall-planted bulbs should be planted deeper than spring-planted bulbs. Most garlic varieties are hardier than multiplier onions. In Virginia, garlic and elephant garlic are planted with approximately 1–1½ in. of soil over the top of each clove. In northern areas, approximately 3–4 in. of soil should cover the cloves. In extreme northern areas, add mulch once the tops of the bulbs die back after fall planting. Space garlic cloves 6 in. apart (4 in. apart if in rows 10–12 in. apart), elephant garlic cloves 10–12 in. apart. Spring Planting: Plant perennial onions shallowly with about 1/3 the bulb above the soil. Small bulbs (less than 1 in. diameter) should be planted so that the soil barely covers the bulb. Garlic and Egyptian walking onions are spring planted with approximately 1 in. of soil covering the top of the cloves. It is essential that the soil be kept moist during the entire period of active growth (except for the last 2 weeks when the bulbs should be unwatered and any mulch removed). If the soil is allowed to dry out just once, growth will be arrested, resulting in smaller bulbs and reduced yields. Heavy mulch between rows and plants will conserve moisture and control weeds. Keep well weeded: alliums and weeds don’t mix! When planted at the proper depth, bulb clusters of multiplier onions form near the soil surface, not beneath the soil. This allows the bulbs to become larger, reduces susceptibility to rot, and improves keeping quality. Bulbs of garlic and topset onions develop from cloves beneath the soil surface. The scapes (flowering stems) that grow from hardneck garlic, elephant garlic, shallots, and occasionally potato onions should be removed for the highest yields. (Scapes do not help the bulbs last longer.) Don’t wait until the ends curl. A slow, steady upward pull is easy and effective, or use shears to snip them off at the base. Young, tender scapes have a milder flavor than the bulbs, and can be cooked, pickled, or frozen for later use, or sold at market. Most perennial onions are dormant during the summer, and weeds will overwhelm them if they’re left in the ground. It’s always better to harvest all the bulbs for storage, then replant in the fall. Egyptian walking onions are an exception, but take care that weeds don’t drown them, as they grow more slowly in summer. Harvesting Onions for Fresh Eating: Egyptian Walking Onions can be harvested for their fresh greens and bulbs from fall through spring. White multipliers are harvested in the spring. For both of these, to maximize greens harvests, cut only the greens and leave the bulbs to regrow. When harvesting bulbs for eating, always leave some bulbs in the ground to multiply. Harvesting for Storage: Harvest dates vary. In Virginia, we harvest alliums from late May through June, but harvest dates vary from year to year according to the weather, and also depend on if a crop is planted in the fall or spring. To prevent rotting, and toughen skins for storage, pull off mulch in the final weeks before harvest, and stop irrigating bulbs. Most problems with multiplier onions and garlic can be traced to improper care during harvest, curing, or storage. Therefore, it is important that you carefully follow the procedures below. Multiplier Onions: Prior to harvest, the neck region of multipliers weakens and the green tops begin to fall down. Do not water them during this period. When approximately 50% of the tops have fallen, the crop has sufficiently ripened and is ready for harvesting. There is no advantage to breaking over the tops of onions still standing (in fact this may shorten the storage life of certain varieties). Not all the tops fall over at the same time. Harvest the mature onions every few days. Those with tops still standing after 7–10 days should be harvested and kept separate from the rest. Eat them first because they will not keep as well. To harvest multipliers, pull the clusters or gently dig them out. Try to do this during dry weather. Don’t leave the bulbs exposed to the hot sun. Lay the tops over the freshly harvested bulbs until you can bring them under shelter. Topset Onions: Topset onions such as Egyptian walking onions are usually grown as a source of onion greens. Thus, the purpose of harvesting the bulbs is usually to transplant or to increase the crop. You can also eat the small, pungent onion bulbs. Wait until the stalks are mostly brown. Do not delay harvesting, because bulbs of some varieties may resprout within a week. 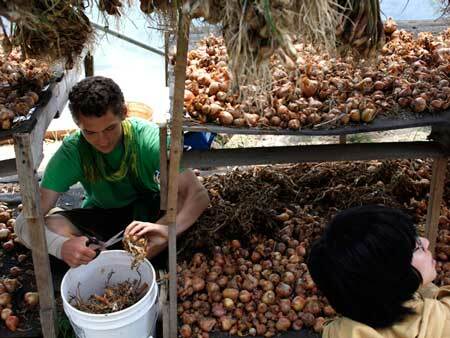 After harvest, handle the bulbs in the same manner as multiplier onions. The bulblets at the tops of the stalks may be used to flavor pickles, or they may be used for increasing the crop. Select the largest, well-formed bulblets for increasing your stock. Garlic: As soon as the lower 1/3 of the leaves turn brown, the bulbs are ready to harvest. Do not wait until the tops fall over and turn brown, because by then the outer bulb scales will have decayed and the crop will lose its attractive appearance and the bulbs will be more difficult to clean. You want to harvest while you still have 5–6 green leaves remaining. If the soil is very dry, lightly irrigate the night before your harvest. Carefully loosen the soil under the bulbs using a digging fork. Gently remove excess soil and keep them out of the sun until you can bring them indoors. 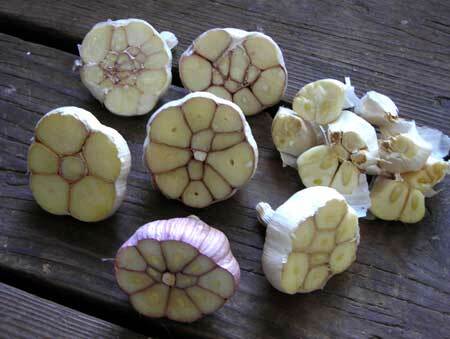 Elephant garlic produces small bulblets or corms alongside the main bulb. You can plant these in the fall but they take 2–3 years to reach full size. Curing is a very important step which improves the flavor and hardiness of the bulbs. Move the onions and garlic to a shaded, warm, dry, and well-ventilated area to complete the drying and curing process. Spread them out in a thin layer on wire screens or wooden shelves. Many people use one or more fans to circulate the air. Allow the bulbs to remain undisturbed for 1–2 months. It is important to check for spoiled bulbs during this period of time, but handle them gently and as little as possible. Because the bulbs have a high water content after harvest they are easily bruised and susceptible to rot. Once curing is complete, separate onion clusters, and cut the dried tops 1 in. above the bulb. Your multiplier onions and garlic are now ready for eating, storage, or planting. Potato onions, shallots and garlic store very well over the winter provided that they are well-cured, dry, well-ventilated, and not packed over 4 in. deep. Ideal conditions are a temperature between either 32–40°F or 50–70°F with 60–70% humidity. They will sprout prematurely if kept between 40–50°F (the temperature of many refrigerators). You can use an unheated room in your house, a root cellar, your garage, etc. Maintain good air circulation. Most varieties store reasonably well in a cool room if hung from the ceiling in mesh bags, or spread on shelves in a layer less than 4 in. deep. Inspect onions and garlic once a month or more often. Remove bulbs which have sprouted or spoiled or else the whole batch may spoil. The larger multiplier onion bulbs should be eaten or planted in the fall because they have a tendency to sprout easily. Large bulbs may also be grown in pots or flats in your home during the winter, and used as a source of greens all winter long. The leaves of this hardy leek die back in July or August and resprout in September. Each plant makes loads of little bulbs (5–20 per plant) that will also resprout. Young greens can be eaten all winter, or left to mature until February and then eaten as a slender sweet leek all spring. Plants may also form small seeds some years, depending on weather, location, and if the leeks have been in the same place for more than a year. (Here in Virginia, so far they’ve seeded once in 7 years; the time they seeded was when they were left in the same space for 2 years.) Besides being started from seeds, you can propagate the plants by dividing the bulbs in spring or fall. The bulbs should be spaced out every few years to avoid overcrowding. Perennial leeks are generally started from dried bulbs planted in fall or divisions of plants in early spring. Plant the bulbs 1–2 in. deep, 2 in. apart, in rows 12 in. apart. Cover lightly with mulch. Keep the bed weeded and water as necessary until plants are established. Plants started from seed take 2 years to reach full size. General culture is similar to onions and leeks. The flavor may be affected by your growing conditions. Hot dry weather and high soil sulfur levels may produce stronger tasting bulbs. Bulbs develop their best flavor after they are fully cured. Build up fertile, balanced soil with lots of organic matter. Get a soil test and amend the soil appropriately. Provide good soil drainage. Consider using raised beds. Provide constant, adequate moisture, all season, until the last few weeks before harvest. Consider using drip irrigation rather than sprinklers. You will save water, as well as prevent disease. Maintain good air circulation around the plants with adequate plant spacing. Control weeds. Harvest carefully and cure thoroughly. Dispose of allium refuse immediately. If you compost it, use that compost on trees or shrubs, not on your vegetable beds. Keep an eye on your garden so you catch problems early. Rotate your allium beds every 3–5 years (the longer the rotation, the better). Learn from experienced local growers such as Master Gardeners and your local extension agent. Here is some quick advice about some of the most common pests and diseases. For more extensive info, see the Resources section at the end of this document. Onion Fly (Onion Maggot): The onion fly is most likely to cause problems when 2–3 wet growing seasons occur in a row. Dry growing seasons tend to inhibit the fly. Garlic appears to be totally resistant. If you develop a severe infestation, spring plant all your onions. Onion Thrips: Thrips prefer hot, dry weather. Humid, wet weather and frequent spraying with soapy water (2–3 tablespoons per gallon) may reduce their numbers below damage level. Voles and Field Mice: Moles should be discouraged since voles and field mice travel in their tunnels. Since damage is most likely in the fall, keep setting out mouse traps (baited with peanut butter) through the season. These critters are one reason that it is best not to plant too early in the fall. Onion Neck-Rot: Rot is encouraged by (1) late applications of fertilizer, especially nitrogen; (2) extended wet weather during harvest and curing; (3) poor air circulation due to weeds or mulch applied too close to the necks of the bulbs; (4) downy mildew due to extended rainy weather; (5) cutting off tops before the necks have completely dried. In general, strong-flavored varieties are more resistant than mild-flavored varieties.